In the half of the second round matches, winners were determined during regular games – and a fair share of those results turned out to be somewhat surprising. Let us begin with duels where favorites were victorious. In the first game of the match Ju Wenjunvs. Krush, an early exchange of the queens occurred, after which Black’s play was too artless and passive. Her pawn majority on the queenside had never started to advance; meanwhile, White consistently launched her attack on the opposite flank. A classic textbook example of the endgame technique from the World Champion! On the next day, the many times Champion of the USA managed to organize considerable pressure against her opponent’s position, but then allowed several exchanges of pieces and her chances for a revenge evaporated. Playing with White against A. Muzychuk, Bodnaruk chose a rare branch of the Chelyabinsk Variation connected with exchange sacrifice; however, after starting her play on the kingside, she let the initiative pass to the opponent. Muzychuk promptly forced exchange of the queens and realized her material advantage with confidence. In the second game, a complex position arose in the ending of the opening. After the Russian player had neglected to eliminate White’s far-advanced pawn in time, her pieces lost any coordination whatsoever, so the finalist of the latest knockout championship was not slow in launching her decisive assault. Gunina, who had a highly favorable personal record against Ushenina, did not set any serious problem before her opponent with White, so a quiet draw was declared. In the second game, she had a dangerous cramped position at first, but pawn exchanges initiated by her Ukrainian opponent allowed activation of black pieces. An attempted attack on the kingside was quickly stopped in its tracks; Ushenina gave up a pawn on the queenside but gained no compensation for it at all, and her position crumpled in several moves. A formal favorite of the pair Galliamova vs. Goryachkina was the younger woman; nevertheless, the famous chess player once again demonstrated top class. Playing White, she prepared a plan with queenside castling in the Meran Variation that had been tested only once before that. After Goryachkina refused to trade her “good” bishop for the enemy knight, Galliamova gave it up for the “bad” black bishop herself. As a result, White promptly created concrete threats and, by means of a many-move combinational maneuver, won a piece. 22.Bc6! c4 (22…Qxc6? 23.Ne7+) 23.Bxa8 Rxa8 24.f4! Bxf4 25.Rxd7! Nxd7 26.Ne7+ Kh8 27.Nd5 Qc5 28.Nxf4and although Black was unwilling to resign for a long time after that, she had to accept the inevitable in the end. In the second game, Goryachkina sacrificed her pawn incorrectly in the complex double-edged position. 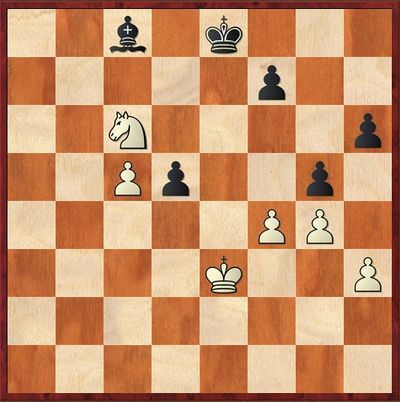 White’s attack came to nothing, and Galliamova won again. A success of a player who has made an essential contribution to the Olympic triumph of the Chinese team is hardly a sensation, but still, she has beaten another player with a rating over 2500. In the first game of the match Dzagnidze-Lei Tingjie,Black easily equalized, while in the second one, the Georgian quite unreasonably gave up a pawn and the Chinese girl cashed in on her material advantage with confidence. In another Chinese-Georgian confrontation, the representative of the former Celestial Empire also emerged victorious. In the first game, Zhai Mo’s faltering performance in the early middle game led to Batsiashvili’s gaining a formidable offensive position, but then Black made an error either in calculation or in execution of her planned variation. 24…d4? Correct is 24…Ng5, threatening with sacrifice on h3, and only as a reply to 25.Nf1 – 25…d4. White king would be in for hard times. 25.Nxe4 Bxe4 26.Qxc5 Bd6? Better is 26…Qb7, and, to play for a win after 27.Rxd4 Re8 28.f3 Bxf3, White has to find intermediate 29.Rb4 Qa8 30.Rxb8 Qxb8 31.gxf3 Rxh3 32.Nf4 Rxf3 33.Bf2. 27.Qxd4! The queen is indirectly defended – 27…Bh2+ 28.Kxh2 Rxd4 29.Rc8+, and White is left two pawns up. In the return game, Batsiashvili overlooked a simple tactics in a complicated but roughly level position and lost an exchange. Thus, Zhai Mo and A. Muzychuk both have four wins to their credit. Alinasab from Iran continues her sensational victory march. In the first game, Socko sacrificed a pawn in an opening variation where White usually plays more reservedly. After failing to find an active continuation, she won back the material in the situation where Black had a bishop pair, an open line and an excellent outpost for her knight. Her positional edge was rapidly increasing, and the Polish player blundered away a piece in an already hopeless position. Alinasab was careless in her handling the opening with White and presented her opponent with an excellent chance for a revenge. However, after winning a pawn, Socko lost the thread of the game, and her undeveloped queenside suffered a powerful storm. As a result, the score was two to nil. Zawadzka’s win over Koneru was another great surprise. The Indian drew easily with Black, but then lowered her guard with White in a level position and allowed the enemy queen into her back ranks. After missing several opportunities to finish the game then and there, Zawadzka eventually managed to realize her advantage in the minor-piece ending. In eight matches tie-breaks were played and, just as in the 1st round, only in one of them 25-minute games were not enough to determine a winner. In the pair Atalik–M.Muzychuk, the former World Champion really had a great streak of luck. In the first game, she underestimated dangers of the minor-piece ending that arose after a tactical skirmish and had to give up a piece for Black’s passed pawn. Atalik overcame technical difficulties and in the ending managed to mate the lonely enemy king with her knight and bishop on move 122. In the return game, Muzychuk’s king was feeling lonely again, but this time on the board crammed with pieces: in the heat of the fight, almost all his subjects had left for the queenside. White, on the contrary, had concentrated considerable forces on the kingside and, following her opponent’s error, obtained an excellent opportunity to finish the match in regular time. To a win leads 28.Nxd6. If 28…exd6 29.e7 Kh8 30.Qe6 Be5 31.Bxd5, then the game ends in a wipeout; and after both 28…Qxa2 29.Nxc8 and 28…Qxd6 29.Bf4, an extra exchange would be more than sufficient. White preferred 28.Nh5 Ne4,and here, instead of cool-headed29.Bb3 that allowed to retain great advantage, played 29.Nf4?, hoping to get to the king through a sacrifice to g6. After 29…Qxa2 30.Nxg6 Qxf2+, she withdrew with 31.Kh1in order to avoid an exchange of the queens in case of31.Kh2 Qg3+. 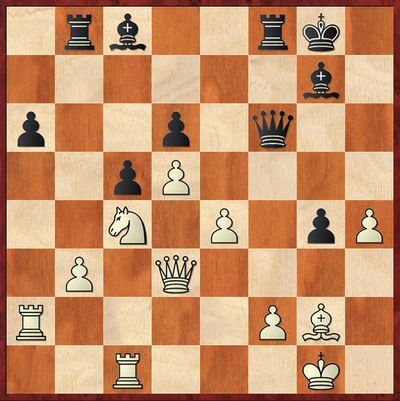 However, Black found a sobering continuation 31…Qe1+! 32.Rxe1 Nf2+ 33.Kh2 Nxg4+ 34.hxg4 hxg6, winning a piece. On the third day, Atalik played a strong third game with Black, making the Ukrainian player worry about maintaining equilibrium in the endgame. With White, she employed a recent novelty in the Slav Gambit system that has brought his convincing win over Dreev to Sarana, but, for reasons unknown, deviated from the original as early as on the next move. Muzychuk replied with a combinational blow that gained her a material advantage. The position remained sharp, but Black still won with confidence. White could have played 49.f5! and then dealt with the d5-pawn. 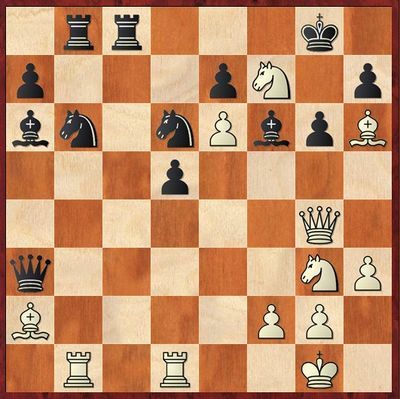 Counterattack 49…Ba6 50.Nb4 Bf1 could not save Black, for example, 51.Nxd5 Bxh3 52.Kd4 Bg2 (52…Bxg4 53.Nf6+, and the bishop is lost; 52…Kd8 53.Ne3, and it is under arrest) 53.c6, and king gets to d6 with a win. Instead, there followed immediate 49.Nb4? f5! 50.Nxd5 Kd8. 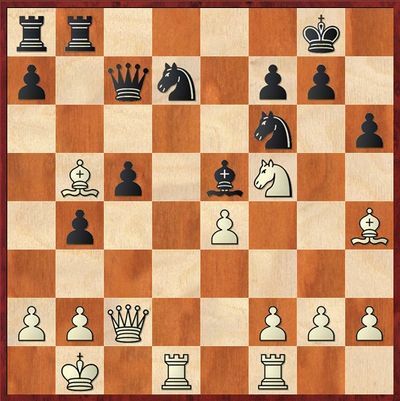 Pawn exchanges are now inevitable, so the Chinese player forces a draw with 51.Nf6 Kc7 52.Nd5+ Kd8 53.Nf6 Kc7 54.Nd5+. Playing for Black during tie-break, Ni Shiqun was first to veer off from the beaten track in the Petroff Defense, but she failed to achieve the comfort she had enjoyed during regular games. The Chinese recklessly pushed her pawns and got into a bad position. Kosteniuk had to show grit and technique in the queen ending, but managed to cash in on her extra pawn eventually. In the second game, the former Champion of the World once again outplayed her opponent convincingly, but it ended on a low note: Black chose the variation that threw away the win, but White missed the saving move and resigned. Nevertheless, Kosteniuk generally played very competently during tie-breaks. In the first regular game of the match Lagno vs. Hoang Thanh Trang, Black went in for a not-quite-correct pawn sacrifice, but after mutual inaccuracies, managed to slip into a major-piece ending with pawns on the same flank. Despite all efforts of the Russian player, she never had a real chance to win, neither with queens on the board nor after their disappearance. On the move 101, the game was drawn. 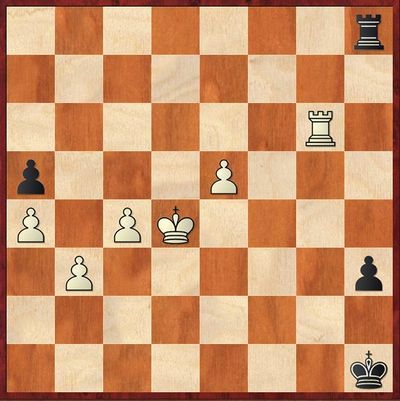 Lagno equalized much more easily with Black. In the first tie-break game, she was most persistent in her search for resources to continue the struggle in a slightly better rook endgame and got her reward in the form of her opponent’s error, after which the game transposed into a pawn ending that was won for Black. In the return game, Hoang, directly after exchange of the queens, was slow with her active break in the center. Having prevented it, White won a backward pawn, and the other ones promptly followed. Khotenashvili and Harika played a long game of little interest on the first day and drawn quickly in the second regular one. In the first rapid game, Harika, who had a spatial advantage, kept hoarding plusses for a long time, then sacrificed the exchange and obtained winning chances. Khotenashvili returned the material and managed to escape in the end thanks to her mad rook. 69.e6 h2 70.e7 Rh4+ 71.Kd5 Rd4+! 72.Kc6 Rxc4+ 73.Kd7 Rc7+ 74.Kd8 Rxe7 75.Kxe7. Stalemate. However, after a more cunning move 69.c5!, the king and his assistants would be able to find a cure for madness. In the rough variation 69…h2 (other ideas do not work because White’s pawns are too far advanced, and she is ever ready to give up her rook for the h-pawn) 70.c6 Rh4+ 71.Kc5 Rc4+ 72.Kb6 Rb4+ (72…Rxc6+ 73.Rxc6!) 73.Kc7 Rb7+ 74.Kd6 Rd7+ 75.Kc5 Rd5+ 76.Kb6, the pawn takes the rook after check from b5 is given! The outcome of the game was decided in the second 25-minute game. Unlike their vis-à-vis, the Georgian’s pieces acted separately in the middle game: first it was her queen that could not find a proper stand for itself, and after Khotenashvili managed to trade it off in a way that was not particularly satisfying for her, it was white light-squared bishop’s turn to start moving in circles around the board. Meanwhile, its dark-squared colleague remained in the original position all along – and perished there on the move 33 because of a tactical misplay. While emerging from the opening in the first game, Stefanova could have gained an impressive advantage after Saduakassova’s reckless one-move attack, but to do so, she would have to calculate complex variations precisely. The former Champion of the World chose more solid continuation. As a result of it, all she was able to gain was a slightly better ending that eventually boiled down to a standard pawn-up rook endgame that Black managed to hold. In the return game, it was already Kazakh player who was close to a success. Even after choosing a far from toughest continuation in the middle game, she still retained a solid edge in the endgame. However, later she overlooked an elementary loss of her extra pawn, and the position became level. In the first tie-break game, Saduakassova unsuccessfully regrouped her forces, and her opponent’s active pawn moves allowed the latter to launch the attack against the enemy king that ended in a quick success. 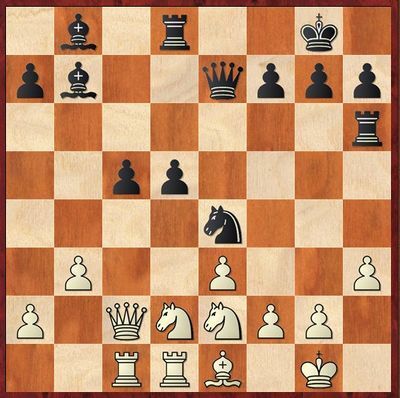 Playing with White, Stefanova gained an advantageous position in the King’s Indian Defense, remained in control throughout the game and settled for perpetual check in an absolutely won situation. While Saduakassova dropped out of the Championship, two other players from former Soviet Central Asian republics created greatest tie-break sensations by eliminating top entries from China. After drawing her two games against Zhao Xue (in both of them, computer evaluations were always close to zero), Abdumalik opted for a serious struggle with Black in the first rapid one. After a kingside break connected with a pawn sacrifice, the Chinese player became confused. 32.Qg3? After32.e5 dxe5 33.Re1 Qxh4 34.d6, situation remains unclear. 32…Bh6 33.Ne3? Loosing time through 33.Re1 Bf4 34.e5 dxe5 35.Qc3 Qxh4 36.Nxe5 looks definitely worse, but White does not lose immediately here at least. 33…Bf4! 34.Nxg4 Qg7, and Black wins both a piece and the whole game. With White, Abdumalik failed to keep the situation under control. At one point, she could have found herself under a mating attack from enemy queen and knight, but luck was on her side. The winner of the last year knockout event Tan Zhongyi drew with Black against Tokhirjonova from the position of strength and then threw away her considerable advantage with White. In the first rapid game, the Uzbek girl seized the initiative and made her opponent solve complex strategic problems. Black was unable to take care of every weakness and lost her central pawn. Afterthat, herpositionbecameundefendable. In the second 25-minute game, Tan temporarily won a pawn in the long variation that had occurred in practice on several previous occasions. However, after her inaccuracies, white queenside pawns found themselves under attack, and presently an extra pawn changed owners. Tokhirjonova easily parried the former champion’s attempts at turning the game around. Pogonina had the longest path to the third round. Playing Black in the first game of her match against young Zhu Jiner, she made a mistake of not taking the f5-pawn and found herself under a standard attack on the kingside. On the next day, the Chinese player opted for complicated struggle. For a long time, her chances were every bit as good, but exchanging dark-squared bishops turned out to be her grave tactical mistake. Employing a pin along the central file, White won a pawn and obtained decisive advantage in the major-piece ending due to a weakness of the opponent’s back ranks. A sufficiently smooth flow of the first tie-break game was broken up by Pogonina’s blunder: she allowed doubling of white rooks along the 7thrank. After several more moves, three black pieces were under fire – a rook, a knight and a bishop. In order to win, Zhu simply had to capture the strongest one, but she chose the knight, thus throwing her advantage away. In the return 25-minute game, the Russian was on the verge of a disaster again, but this time her it was Chinese opponent’s guess as to which piece to take the e4-pawn that turned out to be wrong, so a lion’s share of her advantage went out of the window. In the following, White’s precise defense allowed her to keep out of trouble. The picture of struggle became quite different in the 10-minute games. Zhu was terrible in her handling the opening with Black and was routed. In the second game, Pogonina successfully kept the opponent at arm’s length. The most White could hope for was a draw, but in the end she overlooked a simple blow and lost. Anyway, it did not really matter anymore.